1963-64 Navigators set on typed addressed FDC's. Accumulation of 170 Pre-Decimal and 358 Decimal illustrated FDC's from 1937 to 1990 including 1940 AIF set (4), 1947 Newcastle set (2), 1946 Mitchell set, 1953 Food strips of 3 set, 1954-55 2/- Blue (3) and 2/- Green Olympic Publicity Games, 1955 Cobb and Co set, 1958 2/- Qantas (3), 1961 5/- Cream Paper Cattle (2), 1962 Perth Games set (2), 1963 Royal Visit set (2), 1963 2/3 Cable, 1964 Airmail set, 1965 Anzac set (2), 1967 25¢ Christmas (3), 1968 20¢ Weather Watch (4), 1968 25¢ Intelsat (3), 1969 Christmas set (4), 1969 Flight strip of 3 (2), 1971 Christmas block of 7, 1972 Primary Ind set (2), 1972 Christmas set and many more. Some faults and many early Decimal covers with marked backs caused by photo album. Complete collection of 152 illustrated unaddressed FDC's from 1966 Definitive set of 24 to 1974 Paintings set including 1968 Soil and Medical gutter pair and 1971 Christmas block of 7. Mainly WCS covers, but includes some Royal, Excelsior and Parade covers with some duplication. Largely complete collection of official unaddressed FDC's from 1972 to 2007 including both perf and peel and stick, Joint issues and Australian Antarctic Territory. Odd duplicate, but mostly different. Face Value $1,656.00. Accumulation of official unaddressed FDC's from 1976 to 2001 with some duplication. Face Value $925.00. Also selection of 168 illustrated Pre-Decimal and Decimal FDC's from 1961 to 1977. Mainly WCS and Royal covers. Odd fault and some covers with tone spots. 1984 Barred Edge Frama Button sets on 7 official unaddressed FDC's. Catalogue Value $155.00. 1987 Aboriginal Crafts set and 1988 Australian Crafts set on official unaddressed FDC's. (20 of each). Retail $340.00. 1987 Aboriginal Crafts set, 1988 Australian Crafts set, 1989 Urban Environment set and 1990 Heidelberg and Heritage set on official unaddressed FDC's. (20 of each). Retail $440.00. 1988 37¢ CPE and Leigh Mardon Living Together, 1988 39¢ Living Together, 1989 39¢ Fishing, 1989 41¢ Cycling and 1990 43¢ Skateboarding booklet panes on official unaddressed FDC's. (10 of each). Face Value $236.00. 1988 37¢ CPE (15) and Leigh Mardon (13) Living Together, 1988 39¢ Living Together (24), 1989 39¢ Fishing (23), 1989 41¢ Cycling (16) and 1990 43¢ Skateboarding (5) booklet panes on official unaddressed FDC's. Face Value $374.00. Collection of official unaddressed FDC's from 1976 to 1996 including some Australian Antarctic Territory and the odd duplicate. Face Value $630.00. 1991 Sydney and Perth Across Town Labels on official unaddressed FDC's. (10 of each). Retail $350.00. Accumulation of 336 official unaddressed FDC's and 264 souvenir covers with special or commemorative postmarks from 1971 to 1994, plus 179 PSE's and 137 Aerogrammes mixed mint, cancelled FDI and some special postmarks. Noted 1987 Cup-Pex collection of 27 commemorative covers in special album. Face Value $704.00. Collection of official unaddressed FDC's from 1970 to 1988 with a range of better items and largely complete from 1974 onwards including AAT in 3 PW illustrated First Day Cover albums. Also some Australia Post souvenir covers with special postmarks and 182 mint and 176 cancelled FDI PSE's from 1978 to 1989, plus complete set of Stamp Replica Cards from 1984 to 1989 (1-15) in Seven Seas Replica Card album. Some duplication. Face Value $537.00. Accumulation of official unaddressed FDC's from 1971 to 1996 including some souvenir covers with special postmarks, plus 327 PSE's cancelled FDI from 1979 to 1995. Face Value $995.00. Also small range of Aerogrammes, Maximum Cards, Stamp Collector Card packs and Stamp Replica Cards. Some duplication. Accumulation of official unaddressed FDC's from 1977 to 1990 including some AAT and souvenir covers with special postmarks, plus 179 mint and 180 cancelled FDI PSE's from 1979 to 1993. Face Value $353.00. 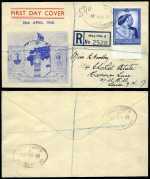 Also small range of Postal Stationery, miscellaneous items and on and off paper mixture including some Foreign. Largely complete collection of official unaddressed FDC's from 1977 to 2001 including Australian Antarctic Territory, few earlier issues and some Joint Issues, booklet panes and souvenir covers with special postmarks in 9 PW illustrated First Day Cover albums. Noted 2000 Olympic Gold Medalist set of 17 numbered FDC's with special cachet. Face Value $988.00. Cost price of the PW albums $970.00. Accumulation of official unaddressed FDC's from 1974 to 1987, plus 255 mint and 205 cancelled FDI PSE's from 1978 to 1990. Some duplication. Face Value $309.00. Accumulation of official unaddressed FDC's from 1981 to 1986 including some pre-stamped envelopes. Face Value $223.00. Accumulation of official unaddressed FDC's from 1984 to 1991. Face Value $258.00. Also small selection of foreign stamps and a small box of coins. Accumulation of many hundreds of official unaddressed FDC's from 1975 to 1993 with some light duplication. Face Value $660.00. Also selection of PSE's cancelled on FDI with a face value of $99.00. 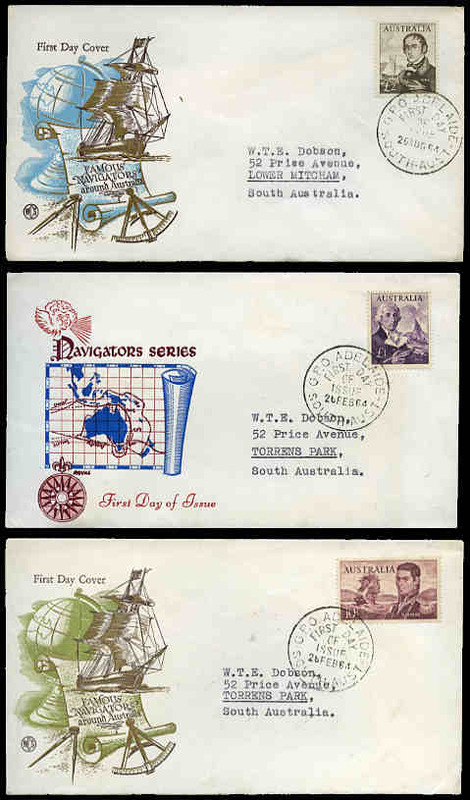 Selection of 438 covers and 130 PSE's from 1966 to 1988 all cancelled with special, relevant or commemorative postmarks including many illustrated and Australia Post souvenir covers and some sets. Also accumulation of official unaddressed FDC's from 1974 to 1989 including some AAT, plus 131 PSE's, 141 Maximum cards and 28 Aerogrammes cancelled FDI from 1978 to 1989 with a Face Value of $503.00. Some duplication. Selection of 258 FDC's, Expedition and souvenir Flight covers from 1957 to 1979 including many base cancel sets, plus range of 1977-79 Antarctic Flight Vignettes MUH, mainly in blocks of 4 imperforate and perforated including proof and specimen sets. Interesting lot. 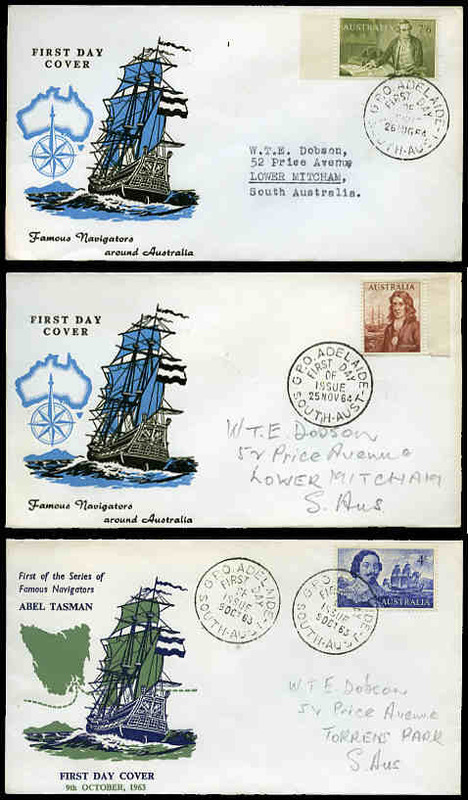 Selection of 153 FDC's from Christmas Island, Cocos (Keeling) Islands, Nauru and Norfolk Island including some duplication and a few PSE's from 1958 to 1999. 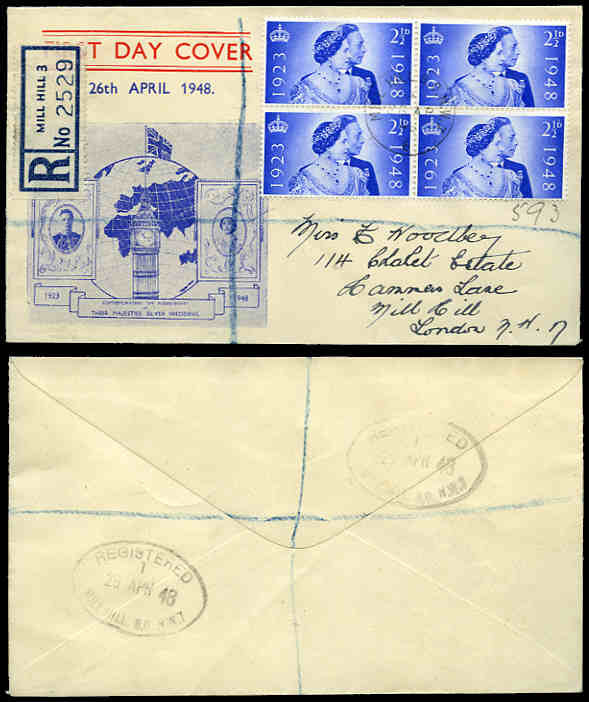 Noted Christmas Island 1958 QEII Definitive set (2), Cocos (Keeling) Islands 1963 Definitive set (plain cover), Norfolk Island 1960 2/8 Local Government (2) and more. Many unaddressed with odd blemish and tone spot. Selection of 141 mainly official unaddressed FDC's from Australian Antarctic Territory, Christmas Island, Cocos (Keeling) Islands, Norfolk Island, New Zealand, Ross Dependency, Pitcairn Islands and Solomon Islands including a range of postal stationery items from 1947 to 1983. Noted Cocos (Keeling) Islands 1963 Definitive set on addressed WCS covers and a range of Antarctic Base cancel covers. Odd fault. Largely complete collection of 156 official unaddressed FDC's from 1967 Education set to 1991 Headdresses set excluding 1985 Post Office Centenary M/S, 1987 Aeroplanes set, 1988 Australian Bicentenary M/S, 1988 Butterfly set and 1988 Olympic Games set only. Odd minor blemish and few duplicates. 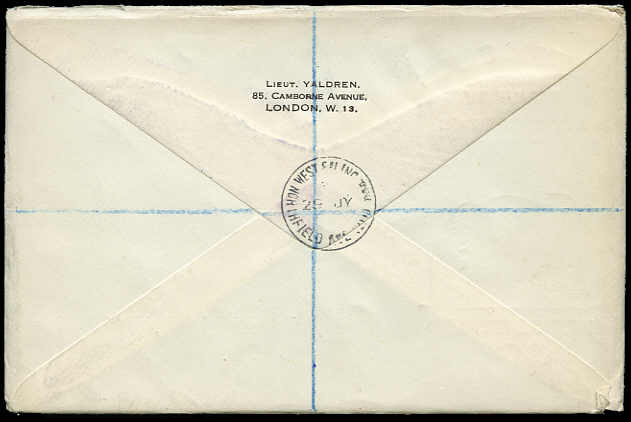 Selection of 54 First Day Covers from 1967 to 1982 including some special postmarks. Also a few Presentation packs and MUH sets. 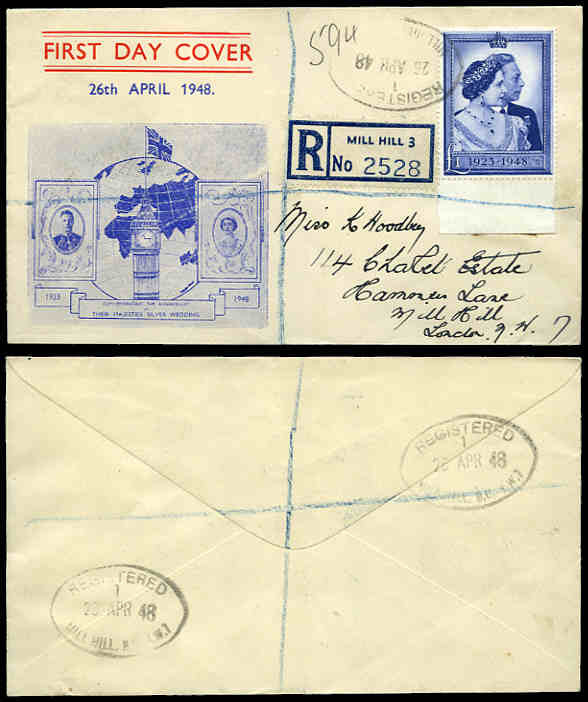 Selection of 239 First Day Covers from 1936 to 1975 with some duplication and a few special postmark and First Flight covers. Also Australia selection of 2 covers carried on the 1934 First Regular Air Mail from Australia to England with stamps including 1934 Vic Centenary and 1934 Macarthur sets. Odd fault. Collection of official unaddressed FDC's from 1971 to 1999 including small range of Maximum cards and some duplicates. Face Value NZ$568.00. Selection of 28 mostly plain FDC's comprising 1934 1½d Photogravure KGV, 1936 ½d, 1½d and 2½d KEVIII, 1937 ½d Green, 1d Scarlet and 2½d Ultramarine KGVI, 1937 1½d Coronation (2), 1946 Victory set, 1949 U.P.U. set, 1951 ½d, 1d, 1½d, 2d and 2½d KGVI new colours (3, one with Festival of Britain set), 1953 Coronation set, 1952-54 Tudor Crown Wmk Wildings set excluding 9d, 10d and 11d values, 1957 4d Parliamentary Conference, 1959 4½d Chestnut Multiple Crown Wmk Wilding (2) and 1960 G.L.O. set. Odd fault. Catalogue Value $3,750.00+. Selection of 36 illustrated FDC's from 1945 to 1966 including a range of Phosphor issues. Noted 1962 N.P.Y., 1963 Lifeboat and 1963 Red Cross Phosphor sets and a range of other better items. Odd blemish, but generally in fine condition. Catalogue Value $3,150.00++. 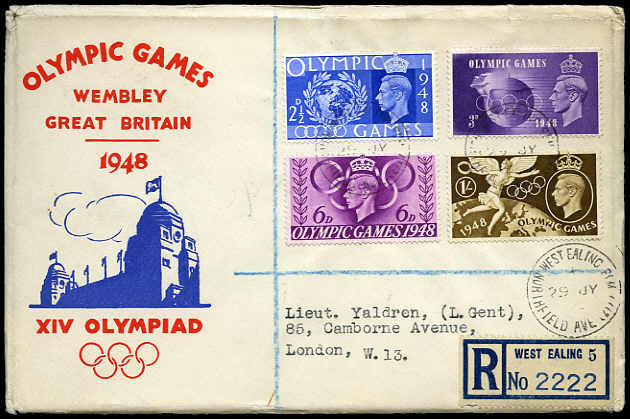 1948 Olympic Games set on registered illustrated FDC. Catalogue Value $168.00. Selection of 327 mainly addressed illustrated FDC's from 1965 to 1998 including some Guernsey, Isle of Man and Jersey, plus range of souvenir covers with special postmarks and few postal stationary items. Some minor blemishes and duplicates. Collection of 76 Machin Head official FDC's from 1972 to 2002 including high value definitives, commemorative booklet panes and few Regional issues, all neatly typed addressed. Catalogue Value $1,325.00. Largely complete collection of official commemorative FDC's from 1971 Literary set to 2002 Astronomy M/S, all with neatly typed addressed. Face Value $645.00. Collection of 195 official addressed commemorative FDC's from 1979 to 2001. Includes odd Definitive issue and majority typed addressed. Few with minor blemishes. Face Value $505.00. Catalogue Value $2,055.00. Largely complete collection of official commemorative FDC's from 2000 Stamp Show M/S to 2007 Species in Recovery set including some booklet panes and regionals. All with neat typewritten addresses. High catalogue value. Face Value $604.00. Complete commemorative collection from 1983 80pf Children and Road Traffic to 1988 Sport Promotion Fund set and West Berlin complete commemorative collection from 1983 50pf Birth Centenary of Joachim Ringelnatz to 1988 Sport Promotion Fund set on illustrated Sieger FDC's. Includes few Definitive issues and odd duplicate.